New York DJ and producer duo The Knocks will release their new six-track EP ‘Brightside’ on 27th February on A&M/Octone, which comes on the back of supporting DJ Shadow on his UK tour at the end of last year. 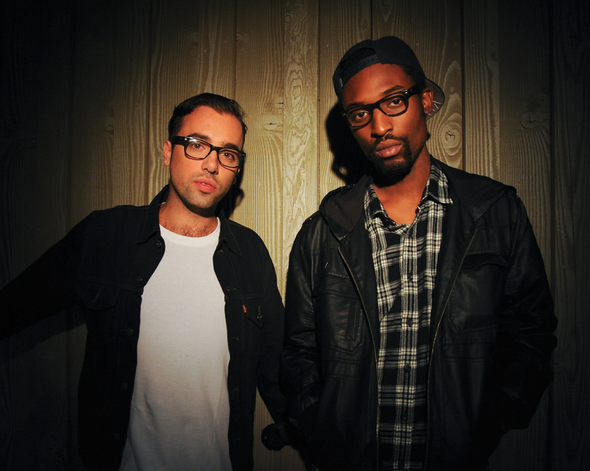 Based out of the Lower East Side of Manhattan, The Knocks are Ben “B-Roc” Ruttner and James “Jpatt” Patterson whose unique mix of beats, sounds and styles has earned them a much deserved following of fans and collaborators alike. The NME declared The Knocks to be one of the “20 hottest producers in music” for their versatile production and remix work for the likes of Katy Perry, Britney Spears, Marina & the Diamonds, Ellie Goulding, Foster the People, Passion Pit and Little Boots to name a few. The lead track from the EP ‘Brightside’, which reached #1 on the Hype Machine Twitter chart, is an uptempo chilled feel-good anthem with smooth vocals that leads into an infectious chorus with a catchy electro beat throughout. Featuring production by Victor Van Vugt (Fischerspooner, PJ Harvey, Nick Cave), Fab Dupont (Shakira, Mark Ronson, Jennifer Lopez), and Gary Go (Benny Benassi), the six tracks on the EP showcase The Knocks’ signature sound from the chilled beats of ‘Magic’ to the fun, disco pop of ‘R.O.Y.L’ and the smooth electro slow jam on ‘All We Got’; these songs cement why The Knocks are one of the most talked about duos on the dance circuit. The Knocks are currently working on their debut record which will be released in September and the EP follows the success of indie single ‘Make it Better’ and their recent release ‘Dancing With the DJ’. Along with DJ Shadow, the duo have recently toured with the likes of Ellie Goulding, Sleigh Bells, MIA and Big Boi along with headlining their own dates in the UK and US. They will be performing at this year’s SXSW festival as part of Neon Gold’s showcase.